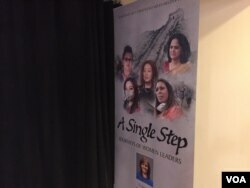 Voice of America’s new documentary, "A Single Step," premiered Thursday at the Asia Society in Manhattan. ​The 30-minute film, narrated by Academy Award-winning actress Sally Field, profiles five female champions of change who live in China, Japan, Fiji, India and Liberia. One of the women profiled, Katie Meyler, was part of a group named as Time magazine's Persons of the Year for educating vulnerable girls in Liberia during the Ebola crisis. 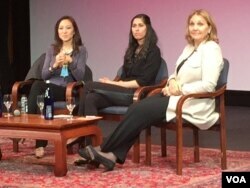 Following the screening, members of a panel discussed how the 1995 Beijing World Conference on Women had shaped their lives and empowered women around the world. The panelists were Aamina Awan, who leads the U.N. women’s global youth engagement strategy for the HerForShe Campaign; Josette Sheeran, president and CEO of the Asia Society; and Peggy Liu, chairperson of the Joint U.S.-China Collaboration on Clean Energy. "A Single Step" can be viewed here on Voice of America’s website.